Win the hearts of your close ones by sending this Magical Celebration Sparkle Hamper and mesmerize them by your sweet gesture. This Hamper is elegantly composed of Pringle (2 Drums of 110 gr. 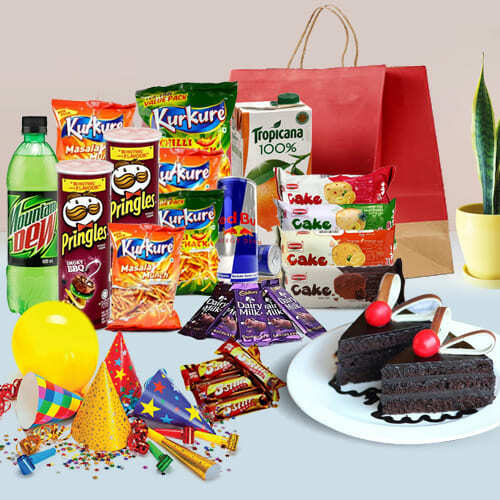 each), Kurkure (5 Packets, Red Bull (2 Cans of 250 ml each), Tropicana Juice (1 ltr), Pepsi (600 ml), Mountain Dew (600 ml), Party Kit -2 Pkts containing Whistle, Caps, Accessories etc., Balloons - Heart Shape 5 Pc., Dairy Milk (5 Pcs), 5 Star (5 Pcs), Chocolate Pastries (8 Pcs.) and Britania Cake (4 Variety) in a Fancy Shopping Bag.